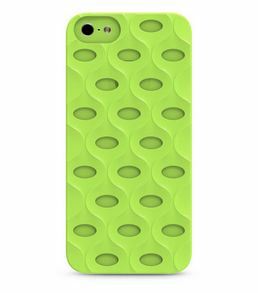 I think it is really cool that cell phone accessory companies have already responded to the need for iPhone 5C cases, and iLuv is on it. The La Pedrera is the first iPhone 5C accessory that I have reviewed, but it certainly won’t be the last. You might notice an odd meshy-look to it, and it certainly is unusual. It is apparently designed by Antoni Gaudi, a renowned architect. It is also made of a sculpted polycarbonate shell, and it is easy to put on the iPhone 5C. Apparently, the card has holes in it to show off the iPhone 5C’s new colors, and it comes in blue, pink, white, yellow, and green. You can get it on the iLuv site for $19.99, and it is quite cool.